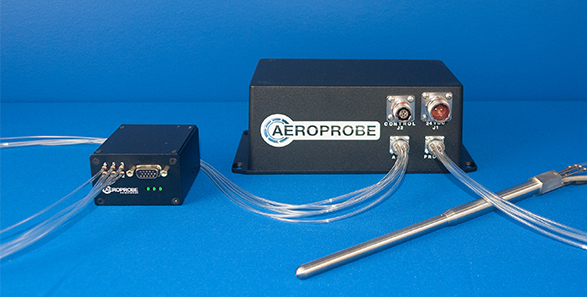 Aeroprobe offers several Micro Air Data Computer (μADC) models well-suited for a wide variety of applications. All models are compatible with Aeroprobe’s standard, heated, and temperature measuring Air Data probes. With an Air Data probe, all models offer a complete solution for acquisition and processing of air flow data at an unprecedented combination of size and accuracy. In addition to being lightweight and cutting-edge, our products are also reliable and expertly engineered. Our µADCs have achieved certifications from independent labs that demonstrate their ability to be operated in harsh conditions, including extreme temperature and vibration environments. Additionally, add-on testing is available for each Pegasus and Destiny unit for application-specific needs. Documentation validating that units from both models meet or exceed the standards needed for certifications is available. Extra Screening (ES) versions of Pegasus and Destiny are also available and undergo thermal soak testing in addition to the standard tests performed on all µADCs. Accessories include a Micro Purge System and a bench-top testing cable. The cable facilitates testing of all the μADC functions in a lab environment before integrating into the aircraft or platform. For pricing and questions, please contact us.